I recently reviewed the Spontex Full Action System Mop & Bucket. You can read my review here and also enter the giveaway (last few days left). 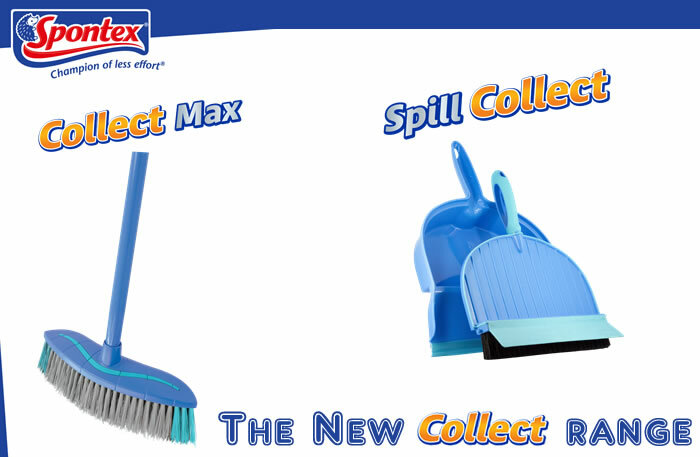 Today, I have another set of useful products from Spontex - their brand new brush ware products, Collect Max and Spill Collect. Read on to see the key features of both the products and for the chance to win a set for yourself. And this time, there will be 2 lucky winners - each winning a set. This new indoor broom from Spontex has been designed to collect the maximum amount of dust and dirt in one easy sweep. Made with mixed non-scratch fibres and an electrostatic blade, the broom attracts fine dust, larger dirt particles and even those bits and pieces that usually get missed while cleaning. The broom has an ergonomic design with the angled head helping to collect all the dirt together. The broom has a telescopic handle and thicker fibres on the outside making it easier to get into awkward corners. It is a very handy and well-designed broom that can be used on all types of floors. An interesting and new take on the traditional dustpan and brush, the Spill Collect has been designed for both dry and wet dirt removal. The brush has strong bristles to sweep up the dirt and dust while a rubber blade helps collects wet spills. The key feature of the Spill Collect is its unique locking system that contains the mess and prevents dripping when carrying it to the bin. Both the pan and the brush are easy to clean and the compact design means storage is easy too. I liked the idea of Spill Collect a lot. It is very efficient at cleaning wet spills, much more than a normal dustpan and brush combo. Spontex are also kindly giving away 2 sets of the new Collect range to 2 lucky readers of this blog. Each winner will receive 1 Collect Max and 1 Spill Collect. Entry is very easy and via the Gleam widget below. So what are you waiting for? Enter now. All the best! Id love to win this as my 3 little people...or should I say terrors love to make SLOT of mess & this would help in the stressfull task of kelping my house from turning in to a zoo.